Repeat Offender or Passing of the Torch? So now that we are through the halfway mark of the NBA season, or we technically have hit that mark, there are always the question as to who the MVP is to this point? Derrick Rose, deservedly took home last year’s award and it begs the question this year, should he retain his crown? Rose is posting 22.2 PPG, 7.7 APG, and 3.4 RPG, in other words, around the same numbers he put up last year. Rose’s influence on his team, however is what put him above and beyond his competition last year. It seems that Rose continues to carry his team this year as well, however; the team fared well in his absence of 5+ games this year. Which, to the voters, may diminish their view on Rose’s presence or absence with his team. However, Rose is clearly the leader of a team filled with a few high B-Listers, in Boozer, Deng and Noah, and an oft-injured Rip Hamilton way past his prime. Competitors look like, Kobe Bryant, Lebron James, and we all know Jeremy Lin’s name will be thrown in there. Kobe is leading the league in scoring, on two bad knees with one wrist and now a broken nose and mild concussion. In other words, “Are you kidding me?” Bryant’s throwing up 28.4 PPG, 4.8 APG, 5.8 RPG, all above his career averages. Now if you look at the Lakers without Kobe, the tale is much different than that of the Bulls without Rose. Both seem to be facilitators on their teams, but Rose’s team is more meshed to play well without him, while the Lakers have their two big men that cannot lead an offense the same way Luol Deng can. Lebron James’ numbers are ridiculous right now averaging 27.4 PPG, 6.8 APG, and 8.1 RPG, this coming from a small forward, or really a point forward. He did most of this without Batman, Dwayne Wade, who is putting up his own numbers of course. The most intriguing and jaw-dropping statistic is that Lebron is shooting 54.7% from the field and 41.3% from beyond the arc. Statistic wise Lebron should be the hands down favorite, however his voters will be swayed because of the team he plays on. Finally, we have Mr. Lin. No he has not played a full season, but he has taken an 8-15 team and turned them around drastically while inserting energy into an entire city. Without him, the Knicks would have been looking forward to next year and the offseason where they could hope to mesh or find themselves a point guard, one most likely way past his prime. But now the Knicks have a 23 year-old franchise point guard in the making. He saved the team, possibly forfeited some blockbuster trades, and may have saved the coaches job, because of how well he meshes into that system. The argument will be made for Lin, but after all is said and done, it will be Kobe Bryant who finds himself as MVP of the shortened NBA Season in my opinion. The guy is a gamer and is tough as nails as he shows night in and night out. Those are my two cents … cash them in if you dare! Debate here for someone else! The NBA’s 61st installment of it’s annual all-star game has now come and gone. The weekend in the Orlando was full of its fair share of highlights for each evening. Friday night, Kevin Hart dominated the celebrity game taking home MVP honors. One of the evenings’ highlights came when Hart threw up an alley-opp to rapper J. Cole. Hart also managed to become the first ever player to be ejected from the game. See the video after the jump. Saturday night is supposed to be the night of nights for the NBA. In a really good all-star weekend, Saturday’s festivities become defining moments that overshadow what occurs during the game Sunday. This year did not feature many Monday morning discussions of “Did you see (insert spectacular play from Saturday night).” In fact, the water cooler probably dispensed a better product than the NBA did. There is nothing wrong, nor fixable about the undercard portions of All-Star Saturday Night. The Three-Point Shootout brought excitement with it’s tie-breakers, and with the added bonus that the competition came down to the last rack of basketballs (Hats off to Kevin Love for winning). The Skills Challenge saw Deron Williams hand Tony Parker the crown missing four 15-foot jump shots in the final round. The Shooting Stars competition saw New York’s finest in Landry Fields, Cappie Pondexter, and Allan Houston bring back the first piece of hardware that Madison Square Garden has seen since the Knicks made it to the Finals in the ’99 Lockout Season. In the much unanticipated dunk competition, there were some pleasant surprises. Chase Budinger channelling his inner Woody Harrelson definitely kicked off a night of originality. Eventual champion, Utah’s last minute entry, Jeremy Evans was cleared for takeoff when he skied over teammate Gordon Hayward, while managing to jam home two basketballs in one swift motion. It is up for debate, but one can argue that Indiana’s Paul George had the dunk of the evening when he was able to successfully execute a 360-degree windmill dunk…in the dark! Overall, while this year’s dunk contest did bring theatrics and originality, it lacked star power. And in a case like this, there is only person to blame…LeBron James! Reggie Miller said it best at the end of Saturday’s dunk contested when he stated, “All the greats at one time in their career participated in the dunk contest.” Fans have been asking for LeBron to participate in the dunk contest ever since 2009 when he said that he would do it the following All-Star Weekend in Dallas, Texas. Expectedly, he backed out of his unofficial agreement. In case it’s not already known to the casual NBA fan, superstars only do these competitions when there is significant monetary incentive. So let’s just gather a large purse for this event then. Surely, the NBA can arrange to put up the necessary amount to make the dunk contest a truly star-studded event as it was in the early 2000’s. The perfect foursome for next year’s contest in Houston should be Andre Igoudala, LeBron James, Blake Griffin, and Jeremy Evans. It’s only fair to give the previous years’ champion the ability to defend his crown. If you pay them, they will participate. That’s the motto. LeBron needs to finally deliver and give the people what they want. Fast forward to the waning minutes of Sunday night’s All-Star Game, and LeBron can be blamed for the East losing. At least that is what the realm of social media would lead a person to believe. LeBron made an ill-advised pass down the stretch but he is one of the two reasons that the East made a late rally to begin with; Deron WIlliams was the other East member responsible. But LeBron did what he does best, and that is carry a team back into a game single-handedly. Had his great pass to Dywane Wade not been dropped, he would not have been labeled as the scapegoat for this game. All in all, it was a great weekend for the NBA to showcase its best and brightest superstars. Thankfully, the weekend was not overshadowed entirely by the latest rumors of the Dwightmare. Similar to Monday night’s game against the Knicks, it’s safe to assume Deron Williams and company have had tonight’s game circled on their calendar all season. Soon to be free agent center Dwight Howard and the Orlando Magic are coming to the Prudential Center tonight. It is sure to be a very unusually festive and welcoming environment for the visiting Howard. Superman may very well get the vibe that it’s an extra home game for him. Brook Lopez will also be making his second start of the season since returning from his foot injury that kept him out one game short of half the season. Lopez said over the weekend that facing Howard would be a good test for him to measure where he is at in terms of returning to his normal play. The underlining story here is that in a little over three weeks, this matchup of the leagues top center’s will take place with the possibility of Howard and Lopez wearing opposite jerseys. It is no secret that the Nets want Howard, and according to his representatives, the potential partnership has mutual feelings. On December 9th, Josh Robbins, of the Orlando Sentinel, broke the news of Howard requesting a trade to the New Jersey Nets. Since then, Nets fans have been ecstatic with the sheer thought of being able to have both Deron Williams and Dwight Howard on the same team headed for Brooklyn. As tonight's game drew closer, the Nets even reduced the cost of tickets for their Loud and Proud section to $12. These aren't coincidences. 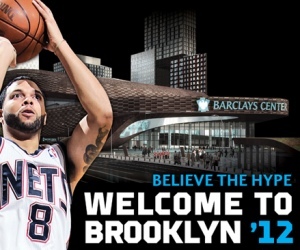 They are subtle hints to show the basketball world that the Nets are serious in their pursuit of the Magic center. Sources say the Nets feel very optimistic, if not borderline confident they will get their man whether through a trade before the March 15th deadline, or in July when free agency starts. And they have every right to be. They will be moving into a brand new state-of-the-art arena in downtown Brooklyn next season, cap space to sign both Dwight and Deron to max contracts, and the richest owner in sports. Howard and Williams would have New York City in the palm of their hands creating a much anticipated rivalry with Amar’e Stoudemire and Carmelo Anthony. But they wouldn't be the New Jersey Nets if there wasn't a potential obstacle or two standing in the way. This comes in the form of the Dallas Mavericks and the Los Angeles Lakers. Over the last few weeks, the Lakers have begun to fall out of the conversation for Howard due to a lack of cohesion in the front office. Reports from HoopsWorld writer Alex Kennedy have stated that during a conversation between Kobe Bryant and Howard, Kobe told him he would not be the first or second scoring option on the Lakers. In addition to this, it is said Bryant went over how it would not be Dwight's team if he came to Los Angeles. Howard was reportedly turned off by those notions. The emergence of a healthy first-time All-Star in Andrew Bynum certainly makes the Lakers organization reluctant to part ways with him in favor of Howard. This leaves the Dallas Mavericks as the only true threat to the Nets superstar foundation. Mavs owner Mark Cuban has gone out of his way to slowly position his franchise to sign both Deron Williams and Dwight Howard this offseason. The Mavs let 3 of their championship pieces in Tyson Chandler, Jose Juan Barea, and DeShawn Stevenson go to other teams during the abbreviated free agency period to clear cap space for next season. The next moves get tricky. Dallas must amnesty Brendan Haywood, waive both Vince Carter and Lamar Odom, allow Jason Kidd and Jason Terry to leave the team as free agents, and then after all of that is done trade Shawn Marion in exchange of another small, expiring contract. If there is anyone in the NBA that can pull this off, it’s certainly Mark Cuban. Even then, the Mavs would not be able to offer both Williams and Howard max contracts since Dirk Nowitzki's current contract pays him $20 million dollars per season. But whose to say they wouldn't take a pay cut to play with one of the best power forwards ever? That alone is a significant threat the Nets have to worry about should they not be able to trade for Howard before the deadline. It’s a rematch. It’s the best thing that could happen to a league coming off a lockout, in which many believed that so much more would be lost, but the only thing lost was one of the Super Bowl quarterback’s brother, some guy named Peyton Manning. So here we come to a rematch of one of the greatest Superbowl’s ever … That’s right I said that. 18-0 Patriots, an offensive juggernaut with a defense that did it’s job … of keeping the other team from scoring more points than its own offense, against the 13-6 Road Warrior New York Football Giants. Patriots looking to go down in history as only the second team ever to not lose a game all year and the Giants trying to make the 1972 Dolphins remain alone atop of THAT mountain a little bit longer. We all know how this went … 18-1 is all you have to say to upset people in New England. So here we are staring at a 6:30 February 5th, 2012 redo for both teams. Just like four years ago, they’ve already played this year and it came down to the final moments of the game. It’ll just add to the Boston vs. New York rivalry, although these two teams aren’t truly rivals, it doesn’t mean bad blood doesn’t exist. Two of the most clutch Quarterbacks in history will stare each other down from sideline to sideline on Sunday and one’s hand will get a little heavier with some more hardware on it Sunday night. So here’s to the rematch and the craziness that will ensue this week leading up to the game … the football boxes, the media conferences, the interviews, the ESPN coverage and obsession, the food and beverages, the hundreds of props in Vegas, and finally here’s to the game itself and the luster of it all. Those are my two cents … cash them in if you wish! Here we go again ladies and gentlemen … Another superstar leaving for the green. This guy came out in the middle of a playoff series and basically waived the white flag on his own team and said his goodbyes as they were trying to make a postseason push to the promised land. Prince-ss Fielder didn’t know where the next chapter was going to be in his own book, but he was well aware where it wouldn’t be and it was with his brothers-in-arms as he spoke out about his upcoming free agency. This is what I hate about sports, why don’t you close your mouth and go out there and play the game. Can you imagine you spending every day with someone for 9 straight months and then suddenly the guy’s coming out saying yeah I’m leaving? But, we’re not even done yet? He didn’t care. All Princess could see were the dollar signs and a huge contract, with what he was hoping would be a long tenure for someone whose knees are sure not to be able to hold up … just ask his father and the former Met Mo Vaughn. I only say former Met because of course the Metropolitans know best about what factor a player’s weight can play into his health. Now I know I am saying this and I have never been offered a $214 million dollar contract to play a sport. But I do know that I would never insult my comrades in such a fashion as Princess did. It was classless, cowardly, and down right unprofessional, in other words … it was WRONG. But hey, the guy just cashed in for over two hundred million and he’ll continue to produce as long as he stays healthy … it’ll never make that approach and that attitude to the game right in any sense. Those are my two cents … cash em in if you must!